This week's menu features three classic comfort foods, all with a lightened-up, vegetarian spin! Instead of your usual pepperoni, top pizza with tasty, fresh goat-cheese crumbles and mushroom slices (you won't even miss the meat!). The soft vegetable tacos are a wonderful way to sneak more veggies into a picky eater's diet. Finally, enjoy a night off with breakfast for dinner. These skillet-baked eggs come together in only about 10 minutes, and all you need to complete the meal is a crusty loaf of bread and a simple green salad. Enjoy! The perfect vegetarian summer meal! 1. Preheat oven to 425 degrees. Toss together corn, 1 tbsp. of olive oil, lime juice, 1 tsp. salt, cumin, bell peppers, and onion in a large bowl, then spread on half a baking sheet. 2. In a large bowl, toss together remaining olive oil, paprika, 1 tsp. salt, and black beans. Spread on the other half of the baking sheet. 3. Bake for 20 to 25 minutes, tossing occasionally, until beans are crispy and veggies are cooked. 4. While that’s baking, combine cabbage, cilantro, vinegar, sugar, diced avocado, radishes, and a pinch of salt. Set aside. 5. In a small bowl, mix together sour cream, chili peppers, and adobo sauce. 6. 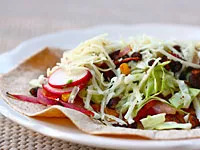 When veggies and beans are done, fill tortillas, then layer on cabbage mixture and a drizzle of sour cream. Sprinkle with cheese. Switch it up with breakfast for dinner with this savory and delicious egg dish. 1. Set your oven to broil on high. Carefully crack eggs into a small bowl, being extra careful not to break the yolks! Set aside. 2. Add butter and cream to a cast-iron skillet and place in oven for 2 to 3 minutes, or until butter has melted completely. Remove from oven (don’t forget to use a hot pad!) and quickly pour in the eggs. 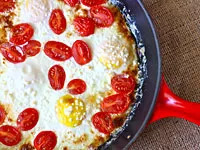 Top eggs with goat cheese, grape tomatoes, salt, and pepper and broil for an additional 5 minutes. 3. Even if the yolks still seem pretty runny, take skillet out—they will carry-over cook and you don’t want to over-bake your yolks! 4. Serve with crusty bread. Adding mushrooms and goat cheese takes this classic pizza to a whole new level! 1. Preheat oven to 425 degrees. Melt the butter in a skillet and cook the mushrooms over medium/low heat until soft and juicy. Set aside. 2. Roll out pizza dough on a floured surface and stretch with hands to form a sheet-pan-size rectangle. Cover with pizza sauce, cooked mushrooms, fresh mozzarella, sliced tomatoes, and goat cheese. 3. Bake for 12 to 15 minutes, or until cheese is bubbling and crust is golden.